A fun New York City cartographic curiosity. 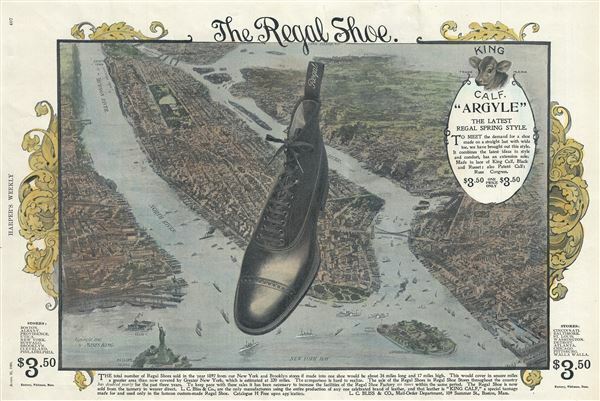 A fun cartographic curiosity, this is an 1898 shoe advertisement set against and backdrop of New York City. The view, prepared in 1897 by Moses King, has here been coopted to demonstrate the prosperity of the Regal Shoe Company. The caption describes how, if all the shoes they cold in 1897 were made into a single shoe that shoe would be 34 miles long and 17 miles higher - hence the illustration at hand. And indeed, the Regal Shoe Company, founded by Elmer J. Bliss in 1893, was one of the largest and most successful shoe companies in the world. In 1895 the company claimed that Czar Nicholas II, Napoleon Bonaparte, the Mikado of Japan, and the Emperor of China all wore Regal shoes. The firm remained prosperous until the Great Depression when it, like so many companies, was forced into bankruptcy. Harper's Weekly, April 23, 1898, p. 407..